Bicycle Studio is a registered charitable trust established in 1993 to encourage and educate members of the community in practical uses of bicycles for ecology, tourism and transportation. The trust provided bicycle maintenance skills classes at Mount Eden Prison in the sentenced male youth section. We also operated home maintenance skills classes in the women's section. The main activity of the organization has become providing training and guidance to: young students, primarily in bicycle mechanical work and to recent immigrants to New Zealand, helping them to improve their skills and providing work experience, primarily in office administration and computers. There is no fee for the training. The trust pays training allowances to trainees and provides experience, career counselling and vocational placement assistance. The man behind these activities is Bruce O'Halloran. To provide job training for school students. To provide experience to new immigrants in office administration, computer work and language improvement. 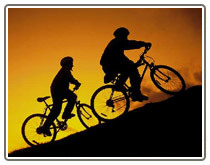 To organize various cycling activities, particularly for bicycle commuting and health improvement. To help people develop their personal skills to achieve their chosen career objectives.